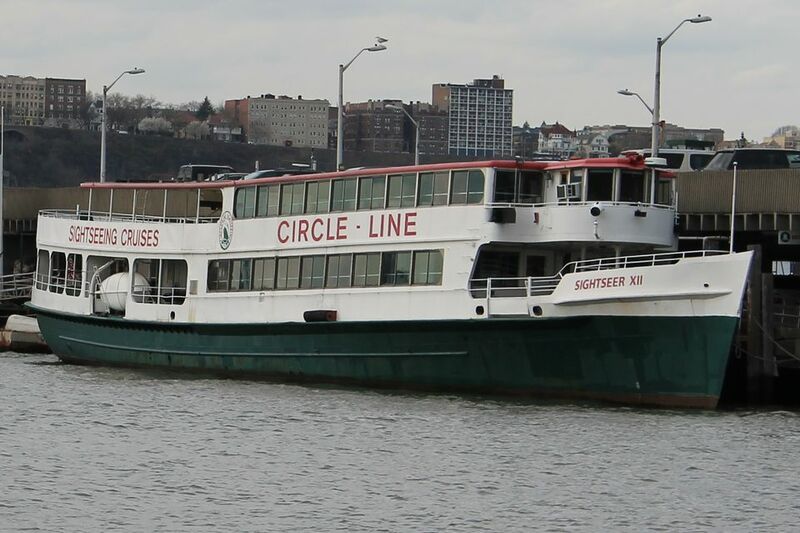 Since 1945, Circle Line has shown visitors New York City from the city's major waterways. The three-hour Full Island Cruise offers visitors a chance to circumnavigate the entire island of Manhattan, and see many of New York City's popular attractions, including the Statue of Liberty, Ellis Island, South Street Seaport and the Empire State Building. Circling Manhattan on the Full Island Cruise is a great way to get an overview of the layout of Manhattan and New York City. It's no wonder that over 60 million passengers have ridden on Circle Line's various cruises -- they offer a unique and manageable way to get an overview of New York City's many attractions. Throughout the three-hour cruise, a tour guide narrates through the boat's speaker system, pointing out important landmarks, sharing trivia and highlighting some of the history of New York City. The trip includes a closeup pass of the Statue of Liberty -- perfect for picture taking, and for many visitors on a short visit this is a great opportunity to view the popular attraction as part of a larger tour. Seeing downtown Manhattan from the water is truly remarkable, as is discovering the northern reaches of Manhattan, which are surprisingly lush and green. Three-hours is a bit on the long side to be on the boat -- though there is plenty of space for walking about, children might be happier on the shorter 2-hour semi-circle cruise. Circle Line's Full Island Cruise is available with The New York Pass and CityPass for a $5 upgrade. During peak times tickets sell out, especially if you have your heart set on a particular cruise, so plan to arrive early to buy your tickets or be flexible about the cruise you go on. The ship is not designed to accommodate handicapped people -- there are narrow stairs down to the bathrooms, etc., but the crew will do what they can to accommodate you. Concessions, including beer and wine, are available on board, but you can bring your own food and non-alcoholic drinks. The souvenir mug with free refills of soda is a good value. They begin boarding the boat about 30 minutes before departure -- you'll want to arrive in time to buy your tickets (which could take 15 minutes, especially on weekends and school breaks) to be near the front of the line. The most desirable seats are along the left-hand side of the boat, as that is the side closest to Manhattan throughout the ride. Wear sunscreen if you plan to sit outside or stand at the bow of the boat -- despite the breeze, you can get quite a bit of sun. After the cruise departs, they open up the bow of the boat for standing room only -- it's worth checking out the view from there, despite the crowds. Bathrooms on board tend to be cleanest early in the trip -- plan accordingly. You can book tickets online. You also will need to exchange the ticket voucher for a boarding pass in the ticketing line once you arrive, so there's really no advantage to buying your tickets online.